Why I understand the fears of British jews. The papers are reporting that Britain is more antisemitic than it’s been for a long time. They’re also reporting that both Jewish celebrities and everyday folk are thinking about leaving Britain. As a Jew, I understand their fear. As a bad, atheist, secular Jew, I understand why they want to move to Israel but think it’s a mad decision. Few of my British friends seem to be taking it seriously, which increases my empathy. They seem to treat it as just some media personalities and subset of Jews being hysterical, that it couldn’t happen in their Britain. It’s true that the exodus to Israel has been going on since before Israel was founded, and that it’s increased in the last ten years. But there is a real fear, based on real events. And your concept of Britain is irrelevant to the Britain that’s out there. Now, I grew up with the IRA and have a very limited experience of terrorism. I remember bombings in Manchester when I was a kid. I used to stay a day a week with my dad, who lived in a flat on top of the Arndale centre. We used to get woken up at nights, regularly, to be told we needed to evacuate because of a bomb threat. That stopped when the IRA blew up the city centre, and the Arndale flats with it. My dad was moved out to another flat, because where he used to live looked like the below. 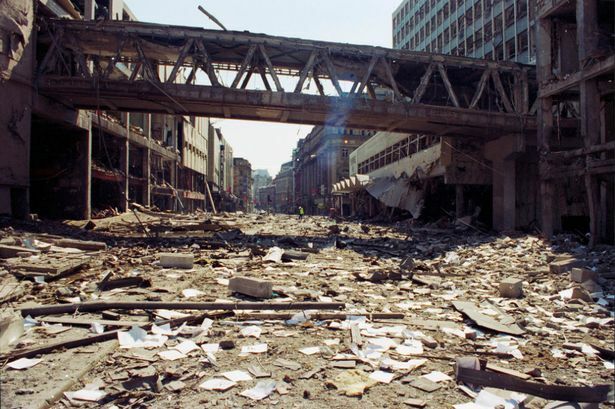 The Manchester Arndale, after the 1996 bombing. Now, I’m not going to say that the IRA were ‘better’ terrorists than the Al Quaeda and ISIS-inspired jihadists. But the majority of the IRA’s fighters had an aim beyond simple bloodthirstiness – they wanted Northern Ireland to be reunited with the rest of the country. There was an aim beyond their terror, which is why they gave warnings. It might have been confused, but there was a feeling that their destruction was of infrastructure to inconvenience the Brits, terror to change minds, and to target the security forces they felt were colluding in their suppression. By contrast, the aim with the current brand of Jihadis does just seem to be terror, to kill as many people as possible – and, in particular, to kill Jews on the side. Look at these graphs of antisemitic violence rising worldwide even as violent crime declines generally. Even in supposedly-enlightened Canada antisemitic crimes trebled, with the majority of perpetrators identifying as Muslim. Targeting an ethnic group for an association with a state or movement is problematic – both in terms of the jihadis targeting Jews over Israel, and Westerners targeting muslims over terrorism. It doesn’t, currently, feel like satisfying the jihadis’ current demands – by pulling out of the Middle East and stopping supporting Israel militarily – will be enough to stop these people but rather that this feels to them like a long-form war between the Islamic states and the West. Which means this is probably going to get worse. So I get why Jews might be scared. And I think Orthodox Jews or synagogue-going Jews in particular probably feel they’re exposed, because they’re easy to identity, from their garb or on the synagogue steps, whilst the terrorists can blend in to Britain’s wonderful multicultural streets. I can see they might want to move to a country where they’re the majority and the terrorists will stand out. And, of course, Jew’s history of persecution is infamous. Jews who stayed around – in Egypt, in Israel under the Seleucids and Romans, in the Rhineland during the First Crusade, in 12th century York, across Europe during the Black Death, in 15th century Spain, in 16th century Portugal, in the 17th century Papal States, in 18th Century Russia, in the 19th century Middle East and Africa, in 1920s Turkey, in 1930s Germany – tended to end up dead. As those polls show, we’re not that far along. The Enlightenment is skin-deep in the areas of the world it touched, and that’s not much of the world. Any Jew who knows his or her history has to agree that, irrespective of how wonderful and tolerant you think the country’s culture appears to be, it’s sane to watch for the same signs again. And to be ready to flee. Despite that, personally, I don’t think Israel is a particularly great place to move to. The chance of its major cities getting blasted off the face of the Earth is a bit too high for my liking. The state of Israel, partly through the making of despicable right-wing political manipulators like Benjamin Netanyahu, has chosen to be aggressive and nasty to every state next to it for too long, and allowed its population to contravene UN resolutions (especially on settlement building) again and again. America has helped with that, by not tying its military funding of Israel to the country enforcing international law. Now Israel is the bugbear of many states in the world, including almost all its neighbours. No, if I was a scared jew, I’d move to New York. Tolerant, with totally Jewish neighbourhoods, too far for most Islamic extremists (who, let’s face it, are mostly European or Middle Eastern) to pay for the plane ticket, and the country as a whole has a philosemitic policy, perhaps as a hang-up from the victory in the Second World War (which is nowadays sold as a humanitarian war, even if that was never the intent of the Allies.) If we look at that anti-semitism article again, America is the only place where anti-semitism hasn’t risen. I’m thankful that, as a secular, atheist Jew, I don’t particularly stand out in public, except when I self-identify in blogs like this. (I’ll admit that I held off posting this for a month, because of fear). For that reason, I’m not thinking of moving yet. But I’ll certainly keep watching.